The Harlem Renaissance was a shape-shifting cultural era. Sugar Hill artists, writers, musicians and scholars turned inward to depict themselves, Black people and the world at large in boundless ways. In celebration of the prowess and promise inherent to our neighborhood, the Museum curated Saya Woolfalk’s The Pollen Catchers’ Color Mixing Machine, a tale of vibrant social transformation. The artist produced a mural and video as a prequel to her ongoing “Empathics” series. The Empathics are a fictional civilization of female characters whose identities morph, taking on traits of both humans and plants, becoming super-beings that are extremely receptive to foreign exchange. The exhibition featured six walls with distinct vignettes of human/plant metamorphosis occurring. The work was produced in relationship to a host of influences that include folklore, anthropology, and science fiction. 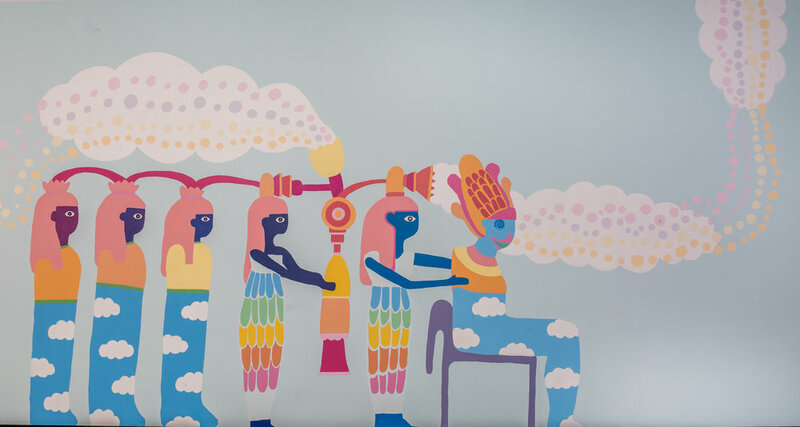 The mural was created in collaboration with the artist’s four-year-old daughter, Aya Woolfalk Mitchell, whose amoebas’ abstractions and other objects rendered from imagination were perfect elements to incorporate into the project. The Pollen Catchers’ Color Mixing Machine was curated by Lauren Kelley, Associate Director, Curatorial Programs. The mural was completed with assistance from the following project managers: Alex Casso and Tajh Rusk; and muralists Solomia Antoniv, Crystal Gonzalez, Tayfun Iper-Nunez, Moise Joseph, Janell Junn, Henry Leo Linton, Eleanor Luken, Vince Maximin, Alicia Prieto, Danny Saab, Virginia Lee Sanchez, and Lalita Santos. Saya Woolfalk is a performance artist based in New York. Woolfalk’s work draws on material from pop culture, ritual, and street spectacle to catalogue and critique our socio-visual landscape. She combines performance, sculpture, painting, and video in her fantastical installations to playfully re-imagine the representational systems that shape our lives. Her visual media then come to act as narratives that shape perception, order symbolic language, and help inform the way that we perceive the world. Saya is represented by Leslie Tonkonow Artworks + Projects. Previous exhibitions of her work have also been on view at The Montclair Art Museum, The Studio Museum in Harlem and the Asian Art Museum of San Francisco.